G Force 2019 was, in almost every sense, the best so far by a mile! Firstly, we were delighted to welcome 270 competitors, to a completely jam-packed and sold-out event. Secondly, the standard of competition was the highest yet, especially in the female category. Thirdly, we were delighted to welcome Katie Coldrick on board to look after the catering and our new sponsor and neighbour Rascals Brewery, as well as loyal event sponsors Metolius climbing and Battle snacks. Qualification started slow and steady on Saturday morning, with the new rolling start time and 4 hour qualification period, there was a nice relaxed feel. It wasn’t long though until we had a packed centre, and tops coming thick and fast! As the crowd thinned in the afternoon, it was starting to become clear that high scores would be required to progress to the semi-final. Out of a possible 300 points, 252 was required to make the men’s Semi-Final. Dom Burns scored 297 to qualify in first, while some of his rivals kept a bit more in reserve for day 2. The women’s comp also saw some very strong qualification performances, with the top 12 female competitors all with over 200 points. As the last score-cards were counted and the route-setters, Rob Hunter and Max Ayrton got to work, stripping the comp wall and putting up the semi-final problems, it was clear that we’d have a very strong field and a hard semi-final for both men and women. The semi-final was run in a standard format for international comps- competitors climb in reverse-ranked order, and have 5 mins to try each boulder, followed by 5 mins rest. There are 4 problems to try, and the competitors don’t get to see them in advance, so it’s a test of ability to read the sequence and learn the movement required quickly, as well as a stiff physical test! Sunday morning saw the semi-final kick off with young competitors Jessica Smith Mc Carthy and Luke Hackett. Despite a few nerves, the first competitors climbed well; Jessica got the first top of the comp and a couple of zones, enough to move up to 14th overall, and Luke also performed well, moving up to 12th. As the semi-final really got underway, the zones and tops became more and more frequent, and soon the crowd couldn’t decide who to watch! In the men’s comp, 3 tops got you safely though, and the top four competitors, David Fitzgerald, Daragh O'Connor, Ciaran Scanlon and Dominic Burns, all had them. The last 2 places were up for grabs, but with a bunch of competitor on 2 tops, it was hard to know who would secure them. Adam Pracownik cinched 1 remaining place by securing all 4 zones, while Sean Hoare, with the opposite tactic, made no errors to flash 2 problems and secure a zone in 1 try, leaving him ahead of the rest of the field on attempts. In the female category, things were even tighter! Our visiting competitors Hannah Slaney, (of team GB), Ajda Remškar and Louise Flockhart secured 4 tops, but right behind them we had a bunch of 6 competitors tied on 3 flashes, with no progress on the 4th boulder. Unfortunately this required us to use countback to the qualification round, which allowed Eugenie Lee, Paola Neal-Fagan and Sandra Jonsson to progress, while Robin Casey, Victoria Watterson and Chloe Condron were knocked out. After the semi-final everyone had time to enjoy the fantastic food, this year a vegetarian feast, courtesy of Kaite Coldrick, of the Fumbally Café and a beer from our neighbours Rascals Brewery. For almost everyone, there was a couple of hours of relaxation, but the route-setters were hard at work again, stripping and resetting the wall for the final, and it was back off to isolation for our finalists! 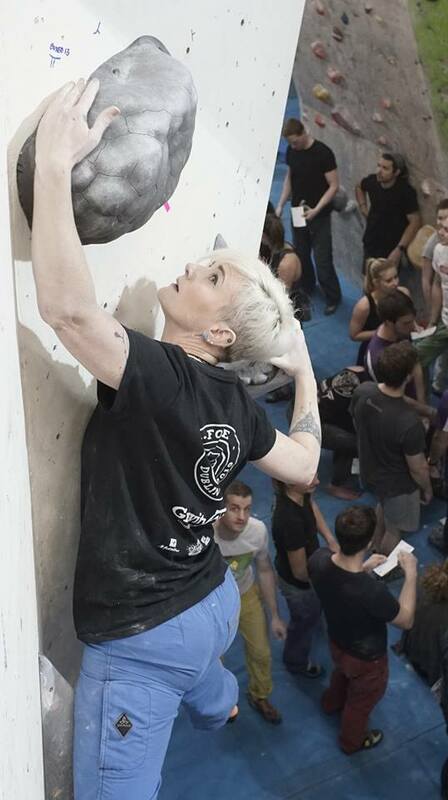 As the final got going, the atmosphere was electric, and an enthusiastic crowd settled in to watch the show of the year in Irish competition climbing. Problem 1 for both categories was in the left end of the wall- the men had some precarious volume smearing out of a corner to start (just what they wanted to settle the nerves!) followed by a little deadpoint to a frustratingly elusive sloper and then some more tenuous smearing… Dom was the first to secure the top, (in his usual casual style!). Female 1 looked like a run-across on the slab, but in fact success was more easily achieved with a slower approach. Once established in the volumes, confusion set in for some, but those who read it correctly continued to the top immediately on securing the zone. Problem 2 was a complete change of temp for the females and a crowd pleaser! A spectacular dyno from under the steepest part of the wall was followed by some slow and steady smearing to finish. Only Hannah secured the top, putting her into a strong position at this stage. For the men, Problem 2 was an amazing co-ordination move; dropping out of a swing onto a volume, with a possible toe-hook (if you could catch it!) to kill the momentum and a double-gaston on very poor volumes. Only Dom managed this test, and only after 6 goes, so it must have been hard! Problem 3 saw the men back in technical smearing mode, with a load of our brand new Enigma volumes to navigate. Everyone read it well and secured the top, despite the precariousness! Meanwhile for the women, it was guns out again, with a dynamic move to a sloper and a fat pinch. Ajda and Louise flashed this one, putting them firmly ahead of the rest, bar Hannah. For the men, problem 4 involved grappling with volumes and slopers, which got slopier the higher you got to a really slopey finish! Ciaran Scanlon styled the top move with a neat flick of the right hand back down to the volume, while Dom just sort of casually Dom’d it to secure all 4 tops. For the women number 4 was a brutal test of how much power you had left! Ajda Remskar was the only one with enough in the tank for this last test, but even a spectacular effort from Ajda couldn’t rival Hannah’s quick top of problem 2, and she ended with 3 tops in 11 attempts to Hannah’s 3 tops in 5. A huge thank-you to Sponsors Battle-Snacks, Metolius Climbing and Rascals Brewery, as well as Climbing Dojo, Hike and Climb, My Therapy and La Sportiva, all of whom generously donated spot prizes, to Katie for the fab food, Rob, Max, Brian, Ricky and Angela for the fab problems, Dannan Markey on the Mic. and Richard and Anthony behind the cameras. Lastl, but not least, a huge thank you all of the Gravity staff who work hard every year to make G Force such a success.